We are leading manufacturer, wholesaler and exporter of Spiral Springs. With enriched industrial experience and knowledge, we are providing our clients with a wide assortment of Disc Springs. 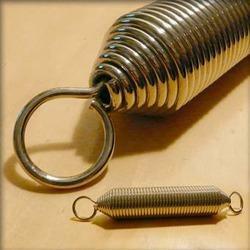 These springs are used in the petrochemical industry to furnaces and boilers. 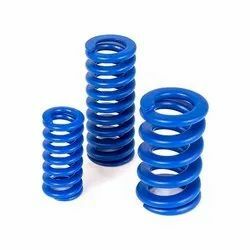 Designed with utmost precision, these springs are sternly manufactured using quality approved material with the help of advanced technology in tune with set industry standards. In addition to this, the provided springs go through numerous tests in order to ensure their flawlessness. We supply a comprehensive range of disc springs, which find its uses an assortment of industries. 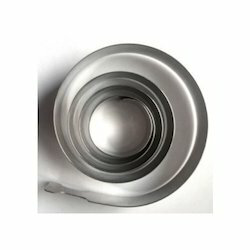 These are manufactured using qualitative raw material which enables it to exhibit properties such as corrosion resistance, high tensile strength, and temperature resistance. 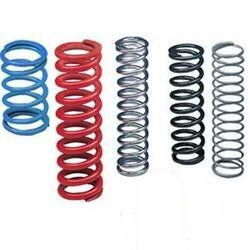 We offer these springs as per the requirement of our clients. De (External Diameter): External diameter at the large end of the spring. Tolerance for this parameter is (+-)2%(indicative). H (free Height): Free Height of disc spring. 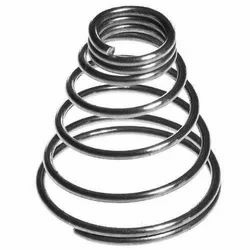 We are engaged in the manufacture, wholesaler, and exporter of a high quality of Helical Springs which have been designed using the best technology available in the market. 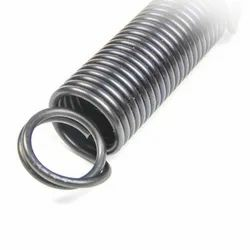 These springs are available in different shapes (barrel shapes, conical, cylindrical, etc) and they have been made using a high quality of raw materials which have been bought from reliable vendors. They are used in the engineering and the automobile industry as they have a high shock absorbing capacity in them. D (wire diameter): This parameter describes the diameter of the wire used as material for spring. De (Larger External Diameter): External diameter at large end of the spring. Tolerance for this parameter is (+-)2%(indicative). P Pitch means centre distance between two coils..
1.Small Solid Height: A Helical springs can be designed so that each active coil fits within the next coil, so the solid height can be equal to one or two thicknesses of wire. This is useful where the solid height is limited. 2.Variable Rate: These springs offer a constant, or uniform pitch, and have an increasing force rate instead of a constant force rate (regular compression springs). The larger coils gradually begin to bottom as a force is applied. A variable pitch can be designed to give a uniform rate if necessary. 3.Stability: Helical springs offers more lateral stability and less tendency to buckle than regular compression springs. Vibration: Resonance and vibration is reduced because Helical springs have a uniform pitch and an increasing natural period of vibration (instead of a constant) as each coil bottoms. We provide premium quality of Conical Springs which offers advantage of a reduced solid height as compared to straight compression springs. Our range is tailor made as per the client specifications and the size also depends as per the machines where it is used. De (External Diameter): External diameter at large end of the spring. Tolerance for this parameter is (+)2% (indicative). 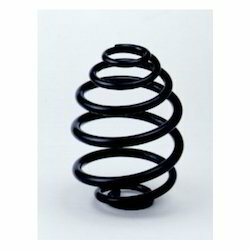 To fulfill the variegated demands of our esteemed clients, we are offering an exclusive range of Spiral Springs. For manufacturing these springs, our adept professionals use superior quality material and progressive technology according to the set industry standards and norms. Apart from this, we also modify these springs as per the numerous requirements of our precious clients. These springs are properly inspected on diverse measures of quality for ensuring their quality. We are counted amongst reckoned names in the industry, committed to offering a wide gamut of Spiral Springs. 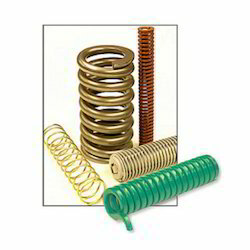 These springs are used in brush motors and in certain applications where a short rotation is required. The provided springs are made from premium grade material with the aid of modern technology in synchronization with set industry norms and standards. 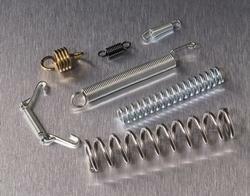 Furthermore, we offer these springs in various dimensions and sizes as per the preferences of our clients. Our Swivel Hook Type Spring are available in various shapes and sizes. These are made in variety of extensions as per customers applications .These are available in both conical and rectangular shape. 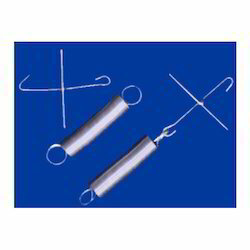 Extension springs offer resistance to pulling force. Our extension springs find their applications in electrical components like switches and also in vacuum cleaner brush height control. 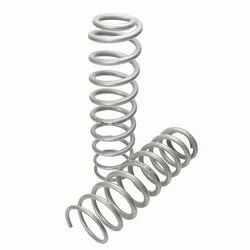 Our German Loop Spring are available in various shapes and sizes. These are made in variety of extensions as per customers applications .These are available in both conical and rectangular shape. Extension springs offer resistance to pulling force. Our extension springs find their applications in electrical components like switches and also in vacuum cleaner brush height control. 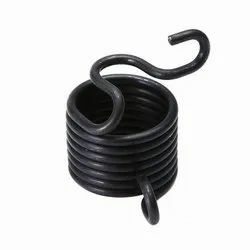 Our Half Hook Spring are available in various shapes and sizes. These are made in variety of extensions as per customers applications .These are available in both conical and rectangular shape. Extension springs offer resistance to pulling force. Our extension springs find their applications in electrical components like switches and also in vacuum cleaner brush height control. 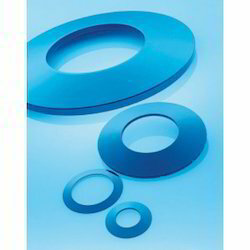 We are manufacturing and supplying Inner Outer Springs in different sizes.